It’s cold and snowy here in Kansas, which is perfect weather for a Hot Toddy. This warm beverage is one I’ve heard of my whole life, usually in books where a ski lodge is the setting. 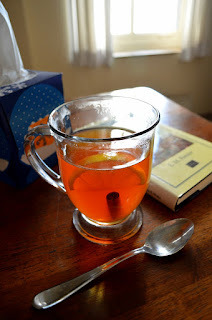 I also think of it as a feel-better drink when you have a cold or are dealing with the winter blahs. 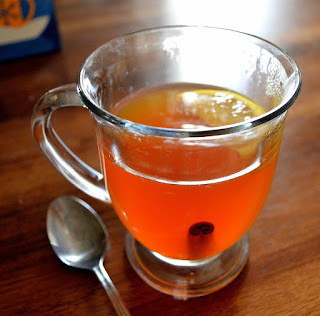 Traditionally made with water, honey, lemon, cinnamon, and spirits (typically whisky, rum, or brandy), some Hot Toddy recipes also include tea, which is how I like it. (It seems more British that way, which pleases this Anglophile’s heart.) 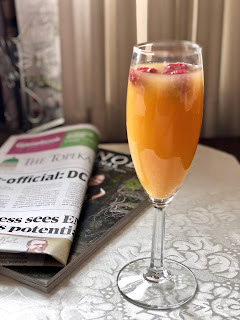 It’s a comforting drink sure to take the chill off the most dismal winter evening. Bring the water to a boil. In a cup, place the tea bag and cinnamon stick. Pour in the boiling water and allow the tea to steep until it reaches your desired strength. Remove the tea bag and add the liquor and honey. Squeeze in the juice from 1/4 of a large lemon. Add a lemon slice. Serve. Sounds perfect for my cold wracked throat! I even have the booze in the pantry cupboard! Take care, Susan. Hope the hot toddy helps. Joan, stay safe and warm!